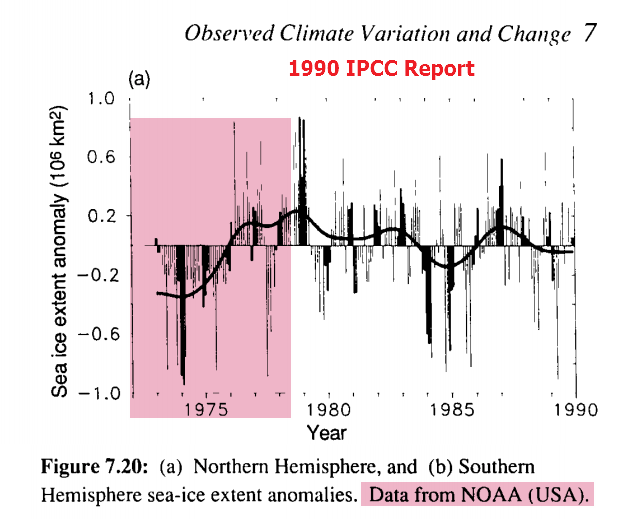 Figure 4 | Northern hemisphere sea ice extent as reported in the first IPCC Assessment Report FAR (1990). Source: IPCC via WUWT via "Steve Goddard"
Sea-ice conditions are now reported regularly in marine synoptic observations, as well as by special reconnaissance flights, and coastal radar. Especially importantly, satellite observations have been used to map sea-ice extent routinely since the early 1970s. The American Navy Joint Ice Center has produced weekly charts which have been digitised by NOAA. These data are summarized in Figure 7 .20 which is based on analyses carried out on a 1° latitude x 2.5° longitude grid. Sea-ice is defined to be present when its concentration exceeds 10% (Ropelewski, 1983). Since about 1976 the areal extent of sea-ice in the Northern Hemisphere has varied about a constant climatological level but in 1972-1975 sea-ice extent was significantly less. Observations from passive microwave satellite sensors have provided a continuous and consistent record of sea ice extent since late 1978. 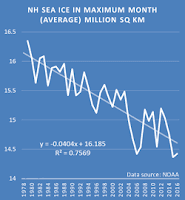 Earlier records, compiled from ice charts and other sources exist, but are not consistent with the satellite record. Here, a method is presented to adjust a compilation of pre-satellite sources to remove discontinuities between the two periods and create a more consistent combined 59-yr time series spanning 1953–2011. Various pre-1979 data products exist, including some passive microwave data from an early single-channel radiometer, but these are primarily based on operational ice charts produced in support of navigation in the Arctic. It's different to what was estimated back in the late 1980s. The range in Richard Verney's FAR chart is only +/- one million sq km. In the Meier 2012 chart, the range is expressed as standard deviation, but going by Figure 1 above, it's probably around +3 m sq km to -1 m sq km, with most years having a minimum at the zero line. Regardless, it should be obvious that Richard is wrong. 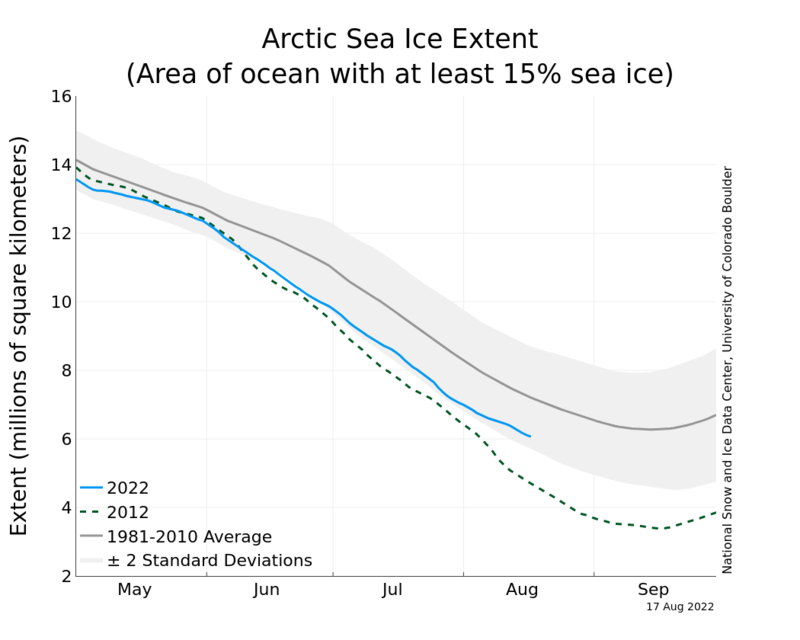 The current sea ice extent in the Arctic is way below what it was in the 1970s. I figured it might be interesting to see if anyone quibbled with Richard. The times they are indeed a changin'. Two people did. 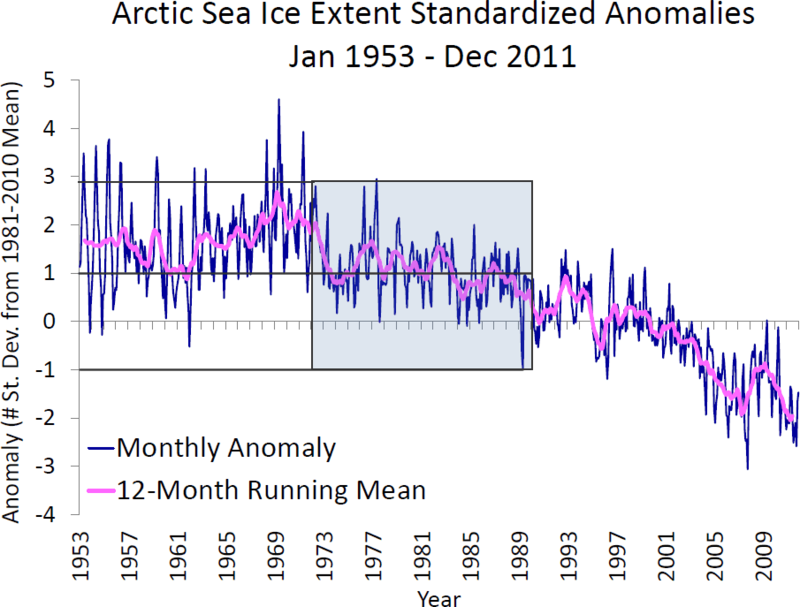 March 29, 2016 at 3:11 amI showed this graph to a science teacher a few years ago and was told it was a bogus fantasy. I then revealed the source as the IPCC (originally NOAA) and was told that the data and graph were old and therefore worthless. Newer algorithms and so on now reveal that the ice is all melting and the polar bears are going to go extinct. Jesus, Joseph, and Mary you can not win with these bloody blokes. You show them data from the freaking IPCC and they discount it. What good would independent data from some science group do? There is nothing happening now that has not happened before, and we live in an amazingly stable epoch in time climate-wise. Hardly Richard, the current max is about 2million sq km below the 1979 value. Phil, is it below the 1974 max value that Richard mentioned? Looks like 1979 experienced a larger extent. Why, oh why didn’t the Vikings send up satellites to check on what it was like sailing there then?? The guys from NASA and their mates are clowns. For a system that changes over Millenia these guys are trying to create a statement for the three months of a year. Overwhelmingly the alarmists, including sections within NASA, BOM, Universities have corrupted the science process. They all start with the desired outcome then try to creat a trail leading to it. Invariably their science is ridiculed and reinforces the views of skeptics. I suppose you cannot blame them for trying to preserve their taxpayer funded careers. marcus has learnt something new today. Will it stick? “In places where sea ice has been lost, those areas of open water will put more heat into the atmosphere because the air is much colder than unfrozen sea water,” Francis said. 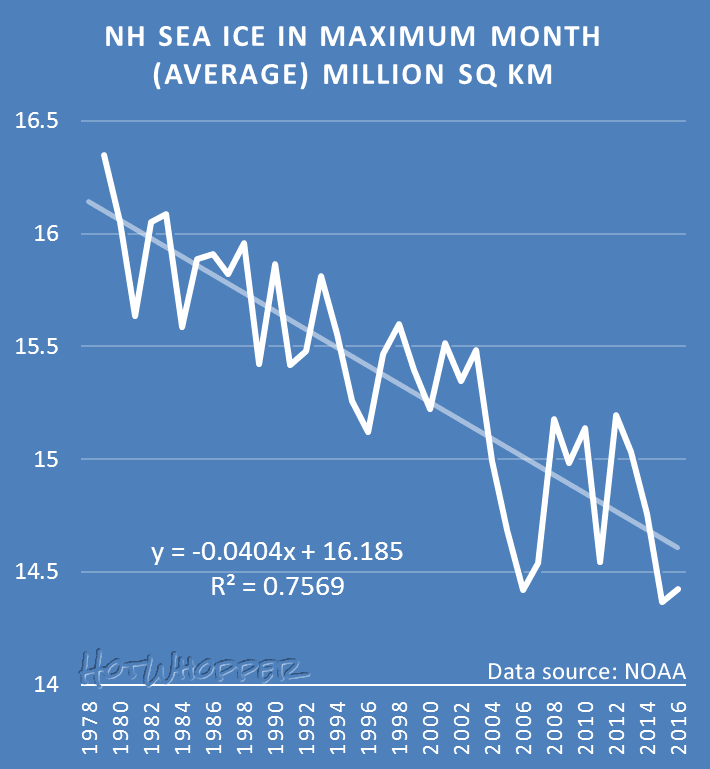 ….So it is a warmer ocean, not a warmer atmosphere that is melting the sea ice ? The pre-1978 satellite data isn't considered very reliable, but there was certainly more ice than today. This data goes back to 1972 and can be seen here, under the "30 year extent" links. It can be matched to up to date data with a little bit of effort. The blatant misrepresentation of data that actually contradicts claims made by the 'skeptics' that cite it is a common occurrence. Another common denier/skeptic misunderstanding is the start date one, i.e. in response to an announcement that, say, 2015 was the hottest year in temperature records going back to 1880, one denier response is "Not many cars putting out CO2 in 1880 therefore global warming is a hoax hahaha". Scientists really should learn from this and frame their announcements in ways that cannot be misunderstood except by the deeply stupid. So don't write "Hottest February since 1880" but rather "Hottest February in 136 years of records". A few more words now to save a great many more later. "Goddard" misrepresent? Perish the thought. He is as honest as the day is long...on Dec 21 in the NH, anyway. I think scientists do frame their announcements in ways that only the deeply stupid can misunderstand or misinterpret. On the whole at least. The thing is the deeply stupid can still wilfully misunderstand however well it is framed. Heh, saw this earlier today. My interpretation of the comments was that they believe the year is still 1990. By the way, I suspect you won't see them posting the adjacent graph of Antarctic sea ice extent in the FAR, which shows a huge drop of 2 million km-2 from 1972 to 1979. 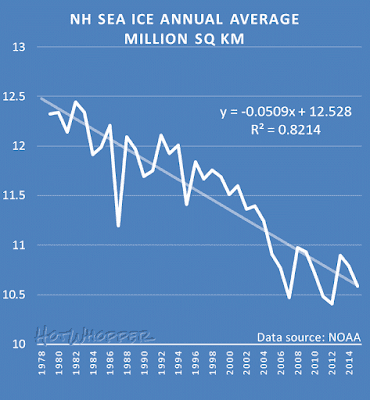 That possibly would put Antarctic sea ice at a larger extent in the early 1970s than present day. Sou - Actually I quietly quibbled with Richard too. I even managed to avoid being [Snip]ped! However my reply to this searing indictment of my intellectual capacity from Anthony himself remains on the WUWT cutting room floor. Being a cowardly cross dresser I never even attempted to display the graph you reveal above to the denizens of WUWT on this occasion. However not a lot of people know that I did once manage to persuade Paul Homewood to refer to it! "They did not have satellite monitoring in 1969" was his witty riposte. And the warmer waters are the result of ocean currents and not CO2, which can not have any significant effect on ocean temperatures. 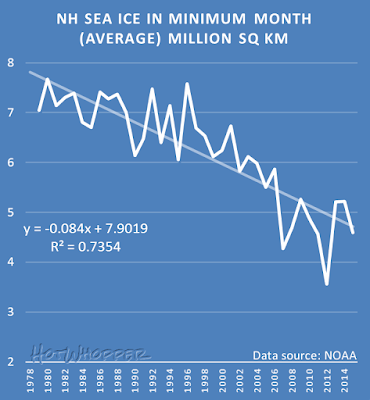 It would be interesting for someone more knowledgeable than I to write something up about the change in sea-ice extent plots between FAR and TAR (unless this has already been done). With a little digging, it seems that the plots in FAR (shown above) and SAR are based on data that was obtained by taking map charts produced by the navy (based on a combination of satellite and other sources, but mostly satellite) and digitizing them with a digitizer tablet (ie. someone traces over the ice extent map with a stylus to create a digital copy). The data for the TAR and later assessments are based on reconstructions directly derived from specific satellite data series, but I don't fully grok the details of that. A feature I've just noticed on some other denier sites. 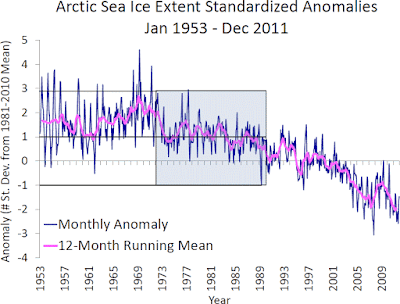 They've started making all their Arctic sea ice graphs begin in 2005. As you can see in Figure 3, 2005 was an unusually low year, and 2016 is going to have very close to the same maximum Arctic sea ice extent as 2005. Furthermore, nearly all of the years in between had higher maximums. We're about to see "No Arctic Sea Ice Decline Since 2005!" 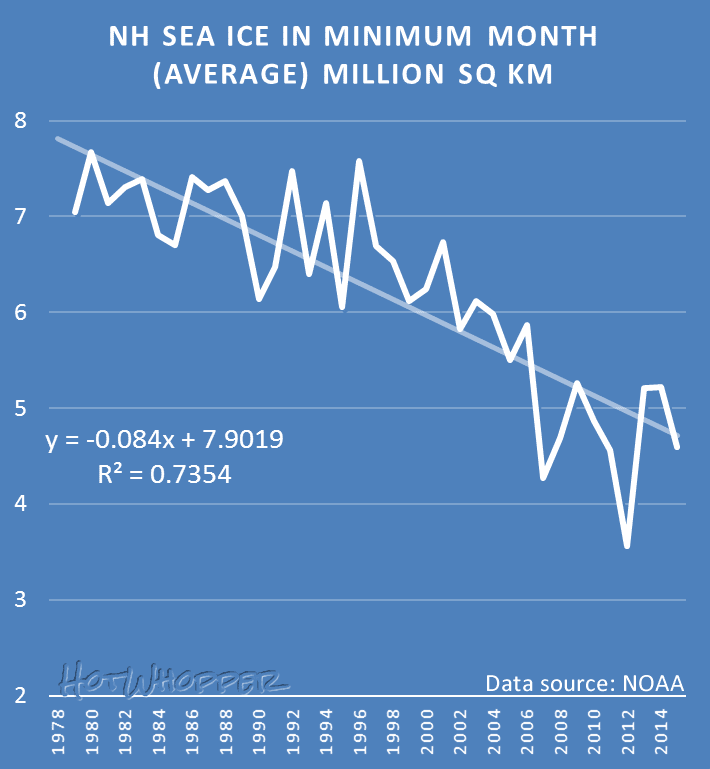 on another weather blog where i participate the sea ice subject came up, as did an article from wuwt from 2009 about subs surfacing at the north pole in the 50s. turns out the poster was not aware of the wuwt "position on climate change". im surprised that the story hasn't been reprised yet this year.